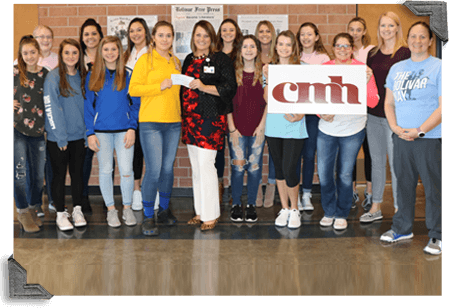 The Bolivar High School volleyball team recently donated $400 to the Carrie J. Babb Cancer Center at Citizens Memorial Hospital. The contribution was made possible from donations collected at their October Pink Out Game. First Row (left-right): Emma Kirklin; Leah Dukes; Adaile Daugherty; Delilah Sheldon; Wren Hall, CMH director of community relations; Shelby Roberts; Emma Larimore; Bri McGlone; and coach Natasha Hamlet. Second Row (left-right): Emily Hogan; Ashley Rash; Sarah Beals; Anna Wolf; Tara Brooks; Lily Shepard; Kallie Jo Barber and coach Krystal Allen. Not pictured: Hope White; Kaylita Jones; Corinne Ames; Trinity Patterson; Elli Burns; Emma Stewart; and Hallie Tucker.